Far away from the the Swiss cantons to which traditional watchmaking is so inextricably connected, lies the small picturesque town of Rinteln in northern Germany's Lower Saxony region, which is considerably closer to the stormy waters of the North Sea than those of Lake Geneva, but in which nonetheless exists a remarkable, free-standing watch industry in microcosm. The story of Schaumburg Watch in Rinteln is one which includes fine manufactory watchmaking, other-wordly materials and even a soupçon of royalty. So this week at The Watch Press we were pleased to be able to spend a little time getting acquainted with a pretty special one of a kind timepiece from the Rinteln manufacture. The Schaumburg Watch Gnomonik Up and Down (or Auf und Ab) Unikatorium Handgraviert from the proudly small German watchmaker is a captivating watch that at once demands a second look, as apart from the decentralised small seconds at the nine, and a power reserve reference at the three, it boasts but one single long pointer which reaches right to the edge of the dial where it's pin-sharp tip hovers above the segmented minutes track to ensure an accurate reading despite the absence of a minute hand. There is no doubt that it does take a little getting used to, although in reality the hour hand does what any conventional hour hand does, but quickly I realised that with the Gnomonik Auf und Ab, although it is quite possible to nail the time to the minute, the pursuit of absolute pinpoint precision is not what the watch maker set out to achieve with it, and once you get comfortable with that fact, then reading the time actually becomes an amusement as well as sharpening one's ability to use the hour hand to keep track of your day. Breaking the minutes track into five-minute segments with bolder quarter hour partitions does make it easier to do. 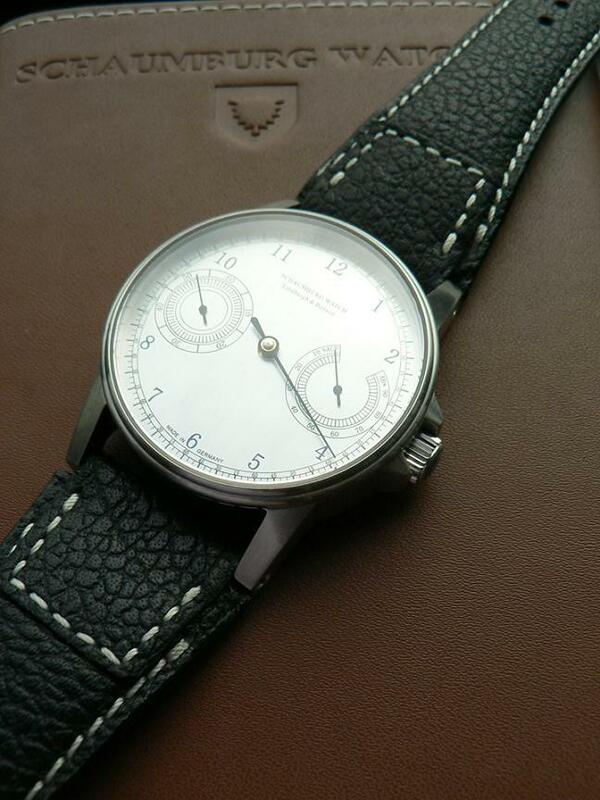 Our piece featured a striking brushed bare steel dial with printed markings, numerals and subdials. The Auf und Ab (Up and Down) indicator at the three displays the remaining energy reserve available and opposes the small seconds subdial at the nine. The watch is presented in a distinctive brushed stainless steel case with horizontal grooves all the way around the side, signed screw-in crown and square-shouldered angular lugs adding further presence to it's look and feel. Turning it over in your hand reveals an exquisitely hand engraved Schaumburg SW 07.9 (base Unitas/ETA 6497) manual winding movement through the sapphire crystal exhibition caseback. 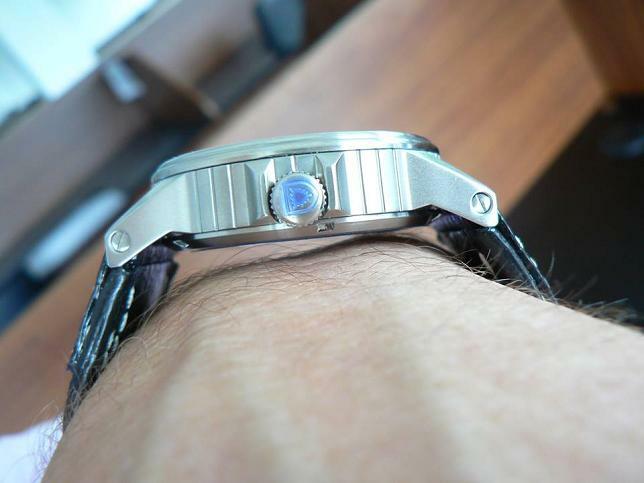 The craftsmen at Schaumburg Watch have painstakingly breathed on very element of this popular base movement (also used for many years in all of the Panerai manual winding pieces), replacing the standard Schaumburg three-quarter plate with a bridge arrangement and adding colour to the mix with the use of blue steel screws. This hand worked variant of the movement is called the Unikatorium Handgraviert and as the name suggests, means each piece individual and unique. As single hand timepieces are very much in a niche, the Schaumburg Watch Gnomonik acquits itself admirably and is indeed a practical instrument with added charisma. It certainly generated an interest among our neighbours as they dropped in to us while we were taking our images, with more than a few proclaiming the immortal 'ah, now I get it!' as the penny dropped. The overall opinion was one of curiosity followed by satisfied admiration of the workmanship and appreciation of the single hand concept which was new to all of our visitors. The Schaumburg Watch Gnomonik Up and Down arrived in a compact leather-clad case and is available on a choice of leather straps with folding clasp or tang buckle to further personalise the watch to the customer's preference. More information on the brand and it's eccentric collections can be found on the Schaumburg Watch website.